He has no name, no life outside of the compounded house he calls home, only his father who warns him the world is a dangerous place, and Janice, the woman who cares for him regardless. Benson lives in a world where births are regulated and approved. The sea levels rose, leading to a shortage of produce, land mass and a society of strict laws to adhere to. In order to give life, you must be provided with a Death Match, in a dystopian society where population control brings fear and injustice. Benson has only ever been known as boy, or son, knowing how different he truly is. So when the opportunity arises to leave the house and learn to swim the murky depths of the river, he can finally make his father proud. But they're coming. Benson is a Slip, a child born without a Death Match who has slipped through the cracks of society and lives illegally. Population Control need no excuse to kill illegals and their families, so the oldest Slip ever seen is now on the run. Benson has now been living on the streets for nine years, surviving each day as a Picker, with the boy who found him the night he fled. He finally has a name and an identity, Benson Mack, possibly the only thing he now owns. But living on the streets comes at a price. Population Control is on the hunt for illegal Slips, broadcasting the hunt into homes all over the country. Walking down the street proves that society no longer cares for privacy, with authorities and portable scanners willing away what little freedom you have. But he is now a priority case, with a psychotic killer tracking him down, Benson is in for the fight of his life. He always suspected there was more to his life that being a Slip on the run, but nothing could prepare him for what he's about to discover, and how society too is starting to revolt. Slip is a difficult book to review without giving away the surprising storyline. Told in the third person, we see all angles of what is essentially the hunt for one boy who the authorities are determined to kill in cold blood. Society has been taught that Slips are a drain on resources, to report those who you suspect are illegal citizens and Population Control will end their life... And that of those who aided and abetted. They are in the streets conducting random retinal scans, they feed propaganda into homes and now have a gun recruit to hunt and kill on their behalf. Known as The Destroyer, he is part man, but mostly machine after enlisting in the armed forces and injured during the call of duty. He's not a character to be taken lightly, he's a womanising psychopath with a violent God complex. I found some of his scenes confronting, although fascinating and disturbing. 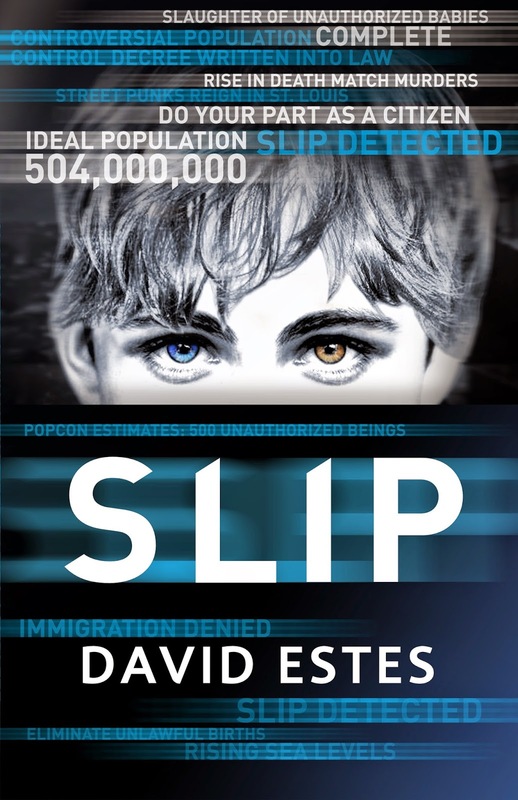 Compared to previous David Estes young adult novels, Slip is far more mature than I had anticipated. In narrative form, following the actions of Benson, Harrison, the president of Population Control Michael Kelly, Janice, and The Destroyer. I felt disconnected from the characters at first, partly due to the storyline being narrative and feeling as though I was a bystander. But within a few chapters, I started to feel for Benson's plight and couldn't help but invest in his character. The one that intrigued me most was Harrison. Although we only see brief interactions from his story, I wanted to know more. He had attitude in abundance and what seems to be a fiery temper. I would have loved to have seen where his storyline is heading. But ending on a high note, I smell a revolution brewing and I'm hoping Harrison will become a big part of the conflict. Compared to his previous series, the Dwellers and the Country Saga, Slip has a completely new feel. David Estes displays a more confident and new style of writing that feels much more mature, both in vocabulary and storyline. A darker in depth read, immaculate world building and an intellectual challenge for the mature young adult reader. Thank you to the author who provided this book in exchange for an honest review. Book depository book open to international entrants. Good luck! Wow the calls of dystopia tempt me to dive back into the genre...and this one sounds amazingly good! It kind of reminds me of The Handmaid's Tale (what with the Pop Con regulating who's born and who isn't) and I'm sort of glad that its written in third person instead of just Benson Mack's view. I bet it really shows how society operates in these sort of times (which aren't far off from our own futures). By the way, is the giveaway US only or international? To win the book of your choice is international, the US only ones have it in brackets beside it, everything else is fair game. The Handmaid's Tale, is that Margaret Atwood? I've never read that one, but might hunt down a copy. The third person narrative lets you see the bigger picture of what's going on and it's frightening. You can see with governments trying to implement blocking websites and seeing what we're looking at, we're not far off it at all are we. If you enjoy the darker side of YA Sarah, you'll love this one. It's a unique spin on science fiction dystopian and the world building is just incredible! This is the first I've heard of this book, though the author's name rings a bell. I love how dark this story sounds, the idea of population control is intriguing too, will keep an eye out for this one! MANDS! You're back! I've missed your reviews and manicures and just seeing you on Twitter talking books. I've reviewed almost all of his young adult titles to date, so you've probably seen me flailing over them and shoving them at readers. Just so stoked to see you back! I've never read anything by this author, and I hadn't heard of this book until now. It sounds quite intense, but very fascinating. Thanks for the review! It's only just been released, so plenty of time to nab a copy in the giveaway. It's really intense and mature, you wont find any dreaded love triangles or instant love here Lauren, just action and incredible world building. I'd love to see what you think of it. I can't believe I haven't read a David Estes book. Dre love this suthor so much and looks like you too, Kelly. I trust you ladies so okay... WHAT BOOK SHOULD I START? This book looks awesome btw but he have a series right? I would start with Fire Country. It's still my favourite, although his writing has matured so much more since then. It reminds me of Blood Red Road by Moira Young. Gritty, sassy and you'll fall in love with a talking cactus that is the heroines inner voice of reason. I can't wait to see what you think of it Paula. I might even reread that one soon too. I'm surprised and impressed with the darker storyline that David has explored in this one, and I thought the new sci-fi world was really interesting as well. I did end up getting invested in Benson, but yeah, some of the characters I couldn't emphasise with. Lovely review Kelly! I found the same Jeann, but it was actually Harrison who intrigued me most. Those few glimpses into his personality really had me hooked. Looking forward to seeing him more in Grip. Fingers crossed. Me too. I have to start the next book Grip shortly to see where his story goes.